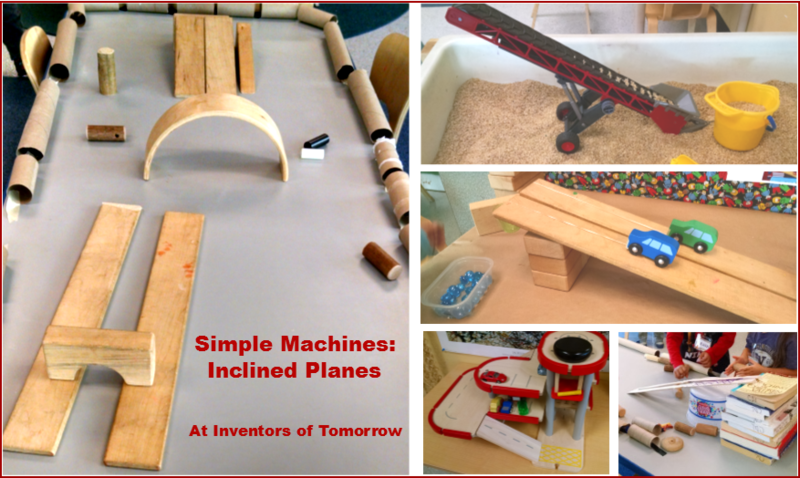 In our first session on Simple Machines, we covered inclined planes and pulleys. The Big Idea: The key point to inclined planes is that moving a heavy load with one takes less force, but the load travels over a longer distance. You could give kids a heavy load and ask them to lift it straight up to a table, shelf, or platform on a slide. Then give them a short, steep ramp to push it up. Then give them a much longer, and not so steep ramp. Which is easiest/the least work? How Much Work? Tie buckets to toy cars. Set up a shallow ramp by propping a board on some books or blocks. Drape the bucket over the end of the ramp. Drop pennies or marbles into the bucket. How many pennies does it take for the weight to pull the car to the top of the ramp? Now set up a steeper ramp. How many pennies (i.e. how much work) to pull the car to the top? 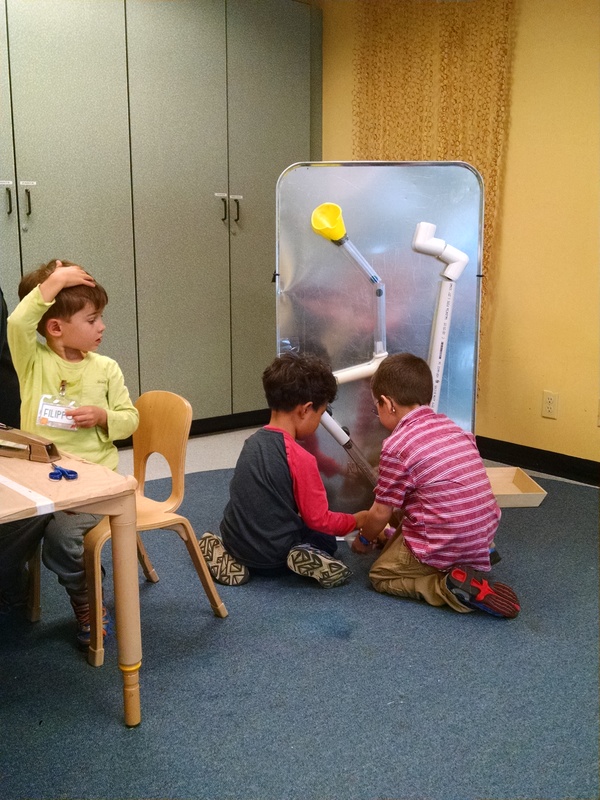 This idea and photo on the left are from the book Simple Machines by Deborah Hodge. The other photo is our from class. 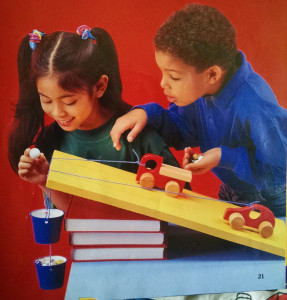 Note: Learning Resources has a Force & Motion Activity Set that lets kids experiment with pendulums and inclined planes. I have not seen it, but the pictures look like the kit provides materials you could use for this activity. I personally prefer making experiments from materials everyone has in their home rather than buying special equipment, because that makes it seem more do-able to replicate at home, but you may prefer pre-fab. Egg Roll: Another way ramps can be used is to make a trip downwards more gentle. A great way to illustrate this would be to drop an egg into a pan from 6 – 12″ high. It would break. Ask: how could I lower this in more gently? Then use a non-steep ramp to slide it gently down into the pan. We didn’t do this in class, because we didn’t want a bunch of broken eggs! But it’s a fun opportunity to do in your own kitchen the next time you’re making scrambled eggs. Or, you can do what we do when we test the egg drop challenge: make a “tester egg.” Take a plastic easter egg and put a bouncy ball inside of it. If you treat it reasonably gently, it won’t break open – just like a real egg. But if it has a hard impact, it will break – like a real egg but without the gooey mess. 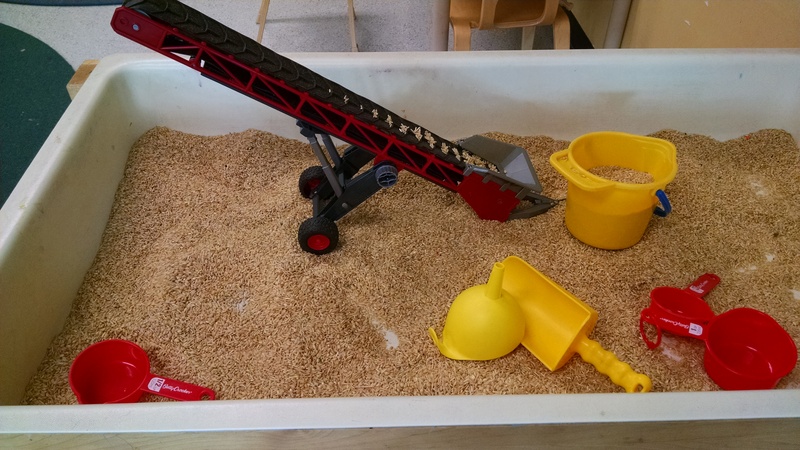 Sensory Tub: We had a conveyor belt toy, and kids could crank the wheel (another simple machine) to create a pulley action to move rice up an inclined plane. You could also just offer ramps to pour rice down: try using some pieces of bamboo cut into a gutter shape or paper towel tubes cut in half lengthwise. 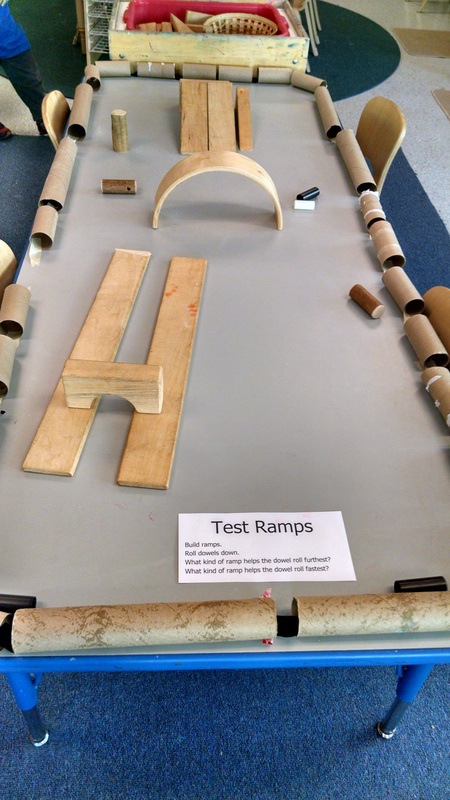 Tinkering Project: We had our DIY marble run set up to explore. 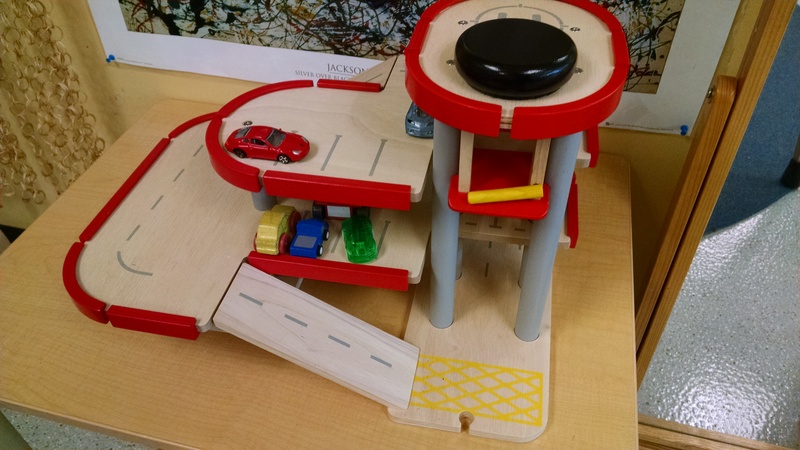 Free Play: Our toy garage has inclined planes (ramps) to drive cars up and down, and an elevator on a pulley (two simple machines in one toy). 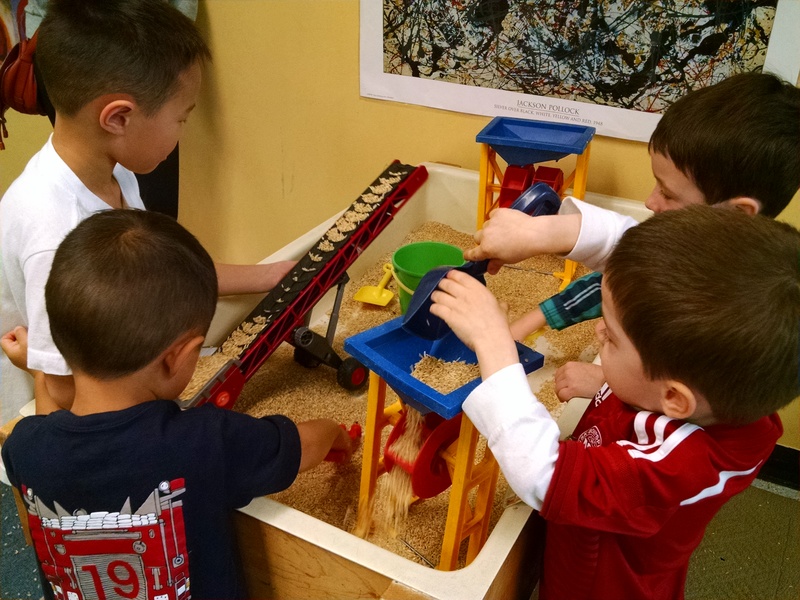 Big Motor: We have a small slide (inclined plane) we set up indoors. We also had two wedge shaped mats and one triangle mat. Kids set up obstacle courses, and discovered that it’s much easier to climb up the non-steep wedge than up the steep triangle. Outdoor Time: Children played on the slide, and rode bikes up and down the hills. We pointed out that it was harder to ride up a hill than ride on the flat, but also how much faster they go when they’re going down the hill. Another great experiment (especially if you read Raising a Bag of Toys in circle time) would be to challenge kids to lift a load up to the top of the slide platform. You could test both pulleys and inclined plane options. Snack: You could offer graham cracker ramps, and grapes to roll down them. Books: We read The Fort on Fourth Street: A Story About the Six Simple Machines , and Raising a Bag of Toys: Pulley vs. Inclined Plane. Find info on other Simple Machines books here. Song: We reprised our Simple Machines theme song. My four-year-old wanted to move a big box up the stairs this week – it was big enough to slide up because it spanned a couple treads – and he talked a lot about how having the inclined plane helped him move big heavy things. 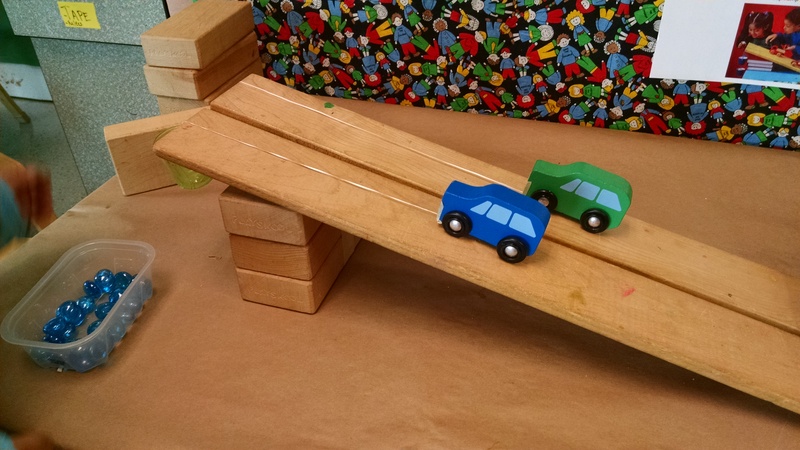 Music / Video: Sid the Science Kid has an episode about inclined planes called My Slide. It includes the song “Push it Up the Inclined Plane” which you can find here.